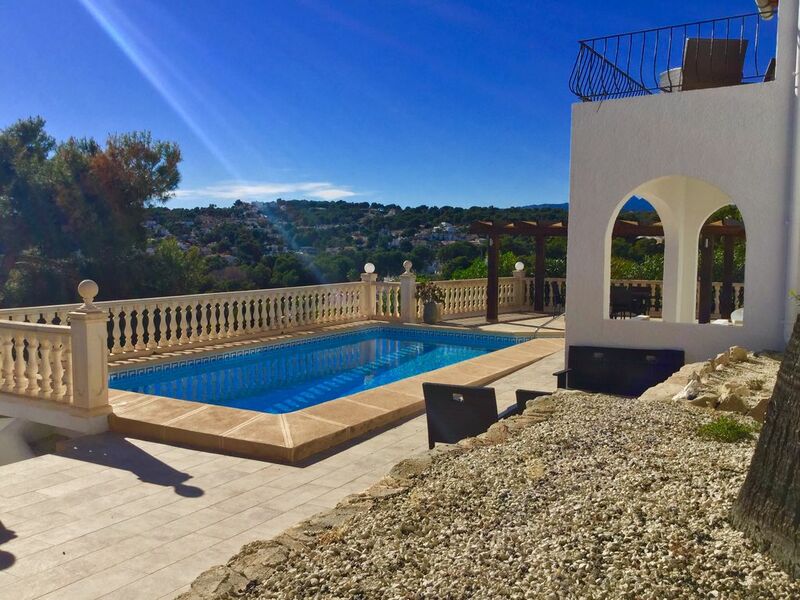 Villa in Moraira, Meerblick, Klimaanlage, Wi-Fi, Tischtennis, zu Fuß in die Stadt. Diese Villa befindet sich auf einem Eckgrundstück mit herrlichem Blick und nur 10 Minuten zu Fuß in die Stadt. Von einer gated Auffahrt betreten Sie die Villa in einen geräumigen Flur. Von dort aus gehen Sie in den offenen Wohnbereich mit Sofas Esstisch, Küche und einem Balkon mit Sofas für Sie die unglaubliche Aussicht zu genießen. Neben dem Wohnbereich finden Sie 1 Schlafzimmer mit Doppelbett, 1 Schlafzimmer mit 2 Einzelbetten, ein Schlafzimmer mit Etagenbett und ein Badezimmer. Von der Lounge führen auch Treppen zum Außenbereich. Von der Eingangshalle führen Treppen zum Hauptschlafzimmer mit Bad. Der Außenbereich bietet mehrere Sitzbereiche rund um den Pool mit Outdoor-Küche, Grill und Liegestühlen. Es gibt auch einen Tischtennistisch, um Sie zu unterhalten. It was a fantastic holiday! The house was great, the small town of moraira was great! Paul & Shelly were really helpful, serviceminded and welcoming. The villa was located in an ideal location on a large corner plot. The outside area is private with plenty of different areas to relax and a great sized pool which was cleaned regularly. There were two large parasols and a naya for shade. The view from the lounge/dining area is breathtaking which was enjoyed eating breakfast and after dinner drinks on the large balcony leading off the lounge. The three bedrooms on the upper level all lead off the lounge but are still private with use of a large bathroom with walk in shower. The main bedroom is accessed via an indoor staircase and is huge with its own ensuite, again very spacious. This room also has the benefit of French doors which lead directly to the outdoor area. The villa is very well equipped throughout both inside and outside, we couldn't fault it at all. For those who are safety conscious, there was use of a safe and the villa is protected by an alarm system. This is our fifth time in Moraira on a villa holiday and this is one of the best villas we have stayed in and would definitely book this again. We have booked properties through Paul and Shelley previously and have always found them easy to deal with, prompt in replying, knowledgable about the area and always happy to help with anything - I wouldn't hesitate in recommending them. Thank you for your kind words & glad your stay was most enjoyable.Look forward to seeing you again soon. Please note: Payments can be made direct to us saving you service fee.